Family planning (FP) is critical in the promotion of community health. It is an intervention that is proven to save lives and foster development. Research supports the notion that family planning is directly linked to improvement in maternal and child health in addition to socio-economic progress. Understanding the unmet need for family planning services is key to improving worldwide reproductive health. 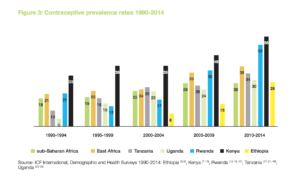 During the last three decades in East Africa, research shows that Kenya and Rwanda are clear leaders in regards to access to and use of contraception. These two countries have a history of implementing targeted and focused programs to improve access to FP services. FP differs in each country in ways such as the amount of methods offered and the extent to which each method is available. Across the sub-region there is an increase in the use of modern contraceptives. But, a steady proportion of women in Ethiopia, Rwanda, and Tanzania are still using traditional methods. While short-term contraception is frequent in the sub-region, there is a new growing number of couples using long-acting FP. However, FP rates vary significantly among all of the countries in focus. Kenya and Rwanda have higher proportions of women using long-term methods whereas the lowest proportion is in Ethiopia. Emerging evidence points to one in every three couples in East Africa discontinuing use of contraceptives within a year. This may be because of side effects, health concerns, the husband’s disapproval, and difficulty of access and or cost issues. Evidence also points to a dissatisfaction with side effects as the most common reason. FP trends in the five countries do not necessarily align. Although progress has been made in terms of prevalence of FP methods, the use of long-term methods remains low. Another finding points to how women in the sub-region may face structural opposition to FP. a) Combating the oppositions, myths and misconceptions that prevent the use of FP services. b) Supporting research on dynamics of FP, including what works to improve access to and use of contraceptives in different contexts.